Lazer X Texas uses Intersphere™ vests and handsets. Our equipment is designed for use by teenagers and adults, as the total weight is approximately 10 pounds. Laser Tag at Lazer X is played in a large 2-story arena lit by blacklights and colored lights. High energy music blares from the speakers as you and your opponents enter the arena for a heart-pumping action-filled game. 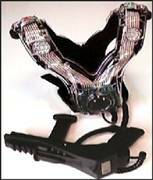 When players enter the arena, their pack will tell them "System activated" and LED lights located on the shoulders, chest, and back will light up. These are the target areas to aim your laser at on other players. There is no confusion when a player gets tagged. The tagged player will hear the sound of breaking glass emitting from the speakers on their vest. A red and green light located on the shoulders of each of the player's vest will begin to flash on and off with the LED lights to signal pack deactivation. This player is not able to tag or be tagged for approximately 6 seconds. After this time, the pack is fully active. The person who made the tag will hear a high pitched "dink" from the speakers of their vest. In the standard SOLO-01 game, the person who makes the tag receives 20 points, and the person getting tagged loses 2 points. Our handsets are designed for two-handed use. "One handing" is a serious rule offense, for safety reasons, and can get a player removed from the game. To tag a player, simply pull the trigger and aim your red laser beam at the lights on your opponent's vest. There is also a sensor located down the barrel of the handset, to eliminate the "snipers" who try to hide behind the obstacles. Players always know what their score is and how they rank among their opponents. An LCD screen illuminates the back of each handset. It includes such information as the player's score, rank, credits. Ammo, lives, and keys are displayed for use in specialized member games. When a player gets tagged, they can look at their display screen. It will say "Player # tagged you". When one player tags another, the one who made the tag can look at their display, and it will say "You hit Player #". After players get their BRIEFING, they move to the ARMORY where they put on the equipment. The Game Marshal gives the final instructions, and players enter the ARENA. Players MOVE around the arena tagging opponents and getting tagged. Score, rank, and credits are updated on the handset display. After the game, players go back into the Armory, remove the equipment, then go to the Command Counter to receive a final SCORE SHEET, which is a detailed print-out of their points, rank, tags made, tags against them, bonus points, accuracy, and more. Photo on this page © Intersphere. Site content ©2002-2006 Emily Cyrus and may not be copied or reproduced in any way.